As National Preparedness Month comes to a close I had an opportunity to check in on the Emergency Kit Cook-Off Contest, sponsored by Arizona State Division of Emergency Management. My mission: Determine the recipe required to cook up a great preparedness campaign (insert canned laughter here). The Emergency Kit Cook-Off is a participatory preparedness activity inspired by the nonperishable contents of a 72-hour emergency food kit. The Kit Cook-Off encourages play with preparedness principles. More to the point, the Kit Cook-Off challenges you to find creative use for the three day’s worth of food and potable water that you squirreled away for the family in case of an emergency. So take a look in your pantry and get cooking. The website includes multiple entry points for people to participate. For instance, they can do some or all of the following: vote on the ingredients to be included contest (this is done prior to September); create a recipe designed with the non-perishable ingredients chosen by the voters (recipe submissions are taken all year); peruse recipes and preparedness tips offered by other citizens; and/or provide a preparedness tip. The variety of involvement opportunities is a great way to engage people who have varying interests and abilities. There are even tangible rewards–if someone enters a recipe they will receive an apron. I interviewed Ethan Riley, a PIO at Arizona DEM and Cook-Off project manager, about this effort and I asked about the necessary components required to create, sustain and grow such an innovative project. He had some interesting insights and provided me the “recipe” they have used and adjusted over the past several years. Strong leadership is required to agree to such a creative project. According to Mr. Riley, the Director of the Arizona DEM and the lead PIO have a great “let’s just try it” ethos. This, he stated, is important in a budget environment that doesn’t allow for extensive market research to determine what types of campaigns might “stick” with the public. Instead, they have taken the approach of taking small risks with imaginative ideas. It should be noted that the campaign had little expenses the first couple of years–this was accomplished by making use of a free blog site, social media and internal staff. In order to try creative ideas it is necessary to add some creative thinkers to the mix. Ethan stated that the concept of the cook-off came from powerful brainstorming sessions involving food–otherwise known as lunch. Their staff consists of people who consider themselves “foodies” e.g. those interested in great food and restaurants. This interest is also a reflection of the current popular culture that includes television shows such as Top Chef, Chopped, Master Chef, and even entire channels such as the Food Network. The lesson to be learned–if something excites and interests you, it is quite possible others will find it interesting as well. 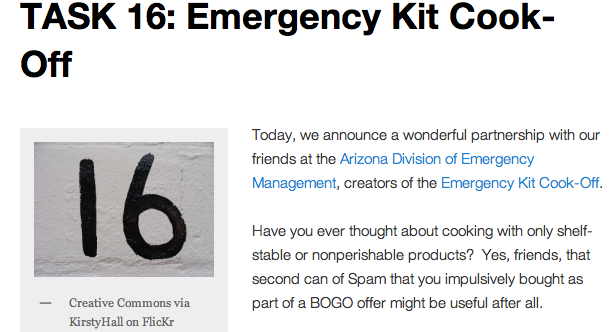 Today, we want you to put together an Emergency Kit Cook-Off recipe. Recipes should use at least one Featured Ingredient supplemented with other nonperishable pantry items. Note: If your organization is interested in a collaboration, contact Arizona DEM via email. We can’t forget the project manager. I was interested in the day-to-day effort required to sustain the program given the current budget situation of most emergency management organizations. Ethan indicated that he spends about 10-15% of his time during National Preparedness Month on the campaign. A little more time was spent gearing up the project, of course, but in terms of daily maintenance, the effort is not as extensive as one might imagine. Regarding their reach, they have not yet compiled their numbers for the month of September; however, I’m guessing that no matter how many people participated, those that did will certainly have a pantry that is ready for a disaster. I look forward to hearing your comments. Let me know what your organization is cooking up! For more details about the Cook-off click here: http://www.emergencykitcookoff.org. This entry was posted in Social Media and Disaster Preparedness and tagged Arizona, Emergency management, Emergency service, National Preparedness Month. Bookmark the permalink. Thanks so much, Kimberly, for your comment and for re-blogging! It’s great to see creative ways to get the community engaged in preparedness efforts. Looking forward to seeing more ideas like this to use throughout the year.